And they said your comic book collection would never be worth anything! The joke is on the haters—your comic books are now valuable collector’s items. The thing about collector’s items is they lose most of their value if any harm befalls them. Collector’s items are treasures if they’re kept in pristine condition and, ideally, never even taken out of their original packaging. One of the best ways to preserve your comic books is by keeping them in a climate controlled self-storage unit. The climate control will ensure no mildew forms in the pages of your comic books. Once mildew sets in, it has a nasty tendency to spread. You’ll need to prep your comic books before sending them off to a storage unit. This involves placing them in protective containers and aligning them so the books remain perfectly straight and flat. You can never be too careful when it comes to your comic books. If you’re going to go through the effort of sourcing rare editions and keeping them in mint condition, it’s worth it to store them properly so they retain their value! A comic book store will be able to provide special comic book bags. Just slip your comic book inside and use the adhesive or glue strip to seal the opening. It doesn’t especially matter what size of bag you buy for your comic books. The important thing is that the book is completely protected from light and air. To keep your comic books completely flat inside their special bags, you’ll need comic book boards. Make sure the boards you buy are acid-free. Acid can degrade your comic books, but some comic book store owners aren’t scrupulous as to what quality boards they buy in order to save a few bucks. You’ll want to make sure your books are as flat and smooth as possible prior to storing them. A single fold in one of the pages will lower the book’s value significantly. If you have an especially valuable edition, it’s worth it to invest in a hard shell case. Like a DVD case, the hard shell will open and snap shut. It’s better protection than a bag, which can fold over during travel. Hard shells are more costly than bags, which are cheaply purchased by the hundreds. Comic book boxes come in two sizes: long and short. These boxes allow comic books to be stored upright, which is ideal for their preservation. If you’re serious about keeping your comic books as collector’s items and investing in their value, get your books certified by the Certified Guaranty Company. Buyers will look for this certification. The company will verify the comic book’s authenticity, then lock the book in a hard case and impress their certification sticker. If the hard case is ever opened, the verification is invalidated. Not all storage facilities are created (or run) equally. The best storage facilities have security at entry points, twenty-four-hour access, climate control, reception staff on duty, and daily professional cleaning. Keeping your comic books at a self-storage facility will protect them from the calamity of everyday life (Oh no! Rover decided your comic books would make a delicious snack), as well as fluctuating temperatures and humidity. 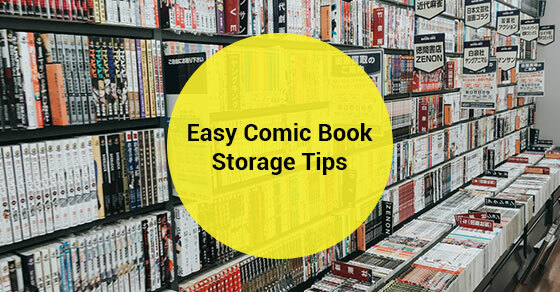 Keeping your comic books in a self-storage unit may seem like a sizeable investment, but it’s the best way to ensure your books stay in mint condition for years to come. A collector worth their salt knows how to store their comic books like a pro. From bagging and boarding, finding the right box and getting their rare editions certified, storing your comic books is a labour of love. Most importantly, keeping your perfectly packed comic books at a storage facility gives you peace of mind that your collection is appreciating in value. Imagine how satisfying it will be to revisit your collection in 10 years time to see your Golden Age comic books looking like they’re fresh off the press. Self-storage units are a must if you need to store collector’s items, or if you’re moving, downsizing, or going through a separation. Jiffy Self-Storage provides the top self-storage units in North Toronto. Call us at (416) 745-4339 or contact us here.